I think all tennis players are worth to be called an inspiration. It is hard work , your choice is to forget all other life and pursue the only goal you have in life. I love Tennis and I am inspired by all people who dedicate their life to this sport. There is something to learn from each player. Even if he or she isn’t in top. My older sister was playing tennis and I remember the whole childhood standing by tennis court. I helped collecting balls during her trainings and step by step I started to play myself. Firstly against the wall, then in small groups with a coach. I know sometimes when kids start to play tennis coaches try to organize everything like fun. But my first coach told me from the beginning: “ It is hard work. You can play and have fun at home. Here I want you to concentrate on your work from the first step you make on court.” I was 5 and those words didn’t mean a lot to me. But now I understand what he meant. During school I have tennis trainings (2-3 h) 6 times a week and 2-3 times of fitness. But my perfect routine would be 3.5-4 h tennis and 1 h fitness everyday. 1 or 2 days off with stretching, massages and swimming. This is actually how most of the academies work. I hope that next year I could change to external school and organize a better workout plan. But before tournaments and during training camps I try to reduce unhealthy products. So top healthy products for me would be bananas, green vegetables and other vegetables as pumpkin and beet (it can be tasty when my mom cooks it), protein from chicken, turkey or some lean fish. Nuts, natural yogurts, some rice or pasta. Olive oil. So from these products you can combine some healthy meals. Very hard! I think after 15-16 years you should choose either school or tennis. External studying and online schools could be a solution. I hope still on tennis court doing my job and improving everyday. 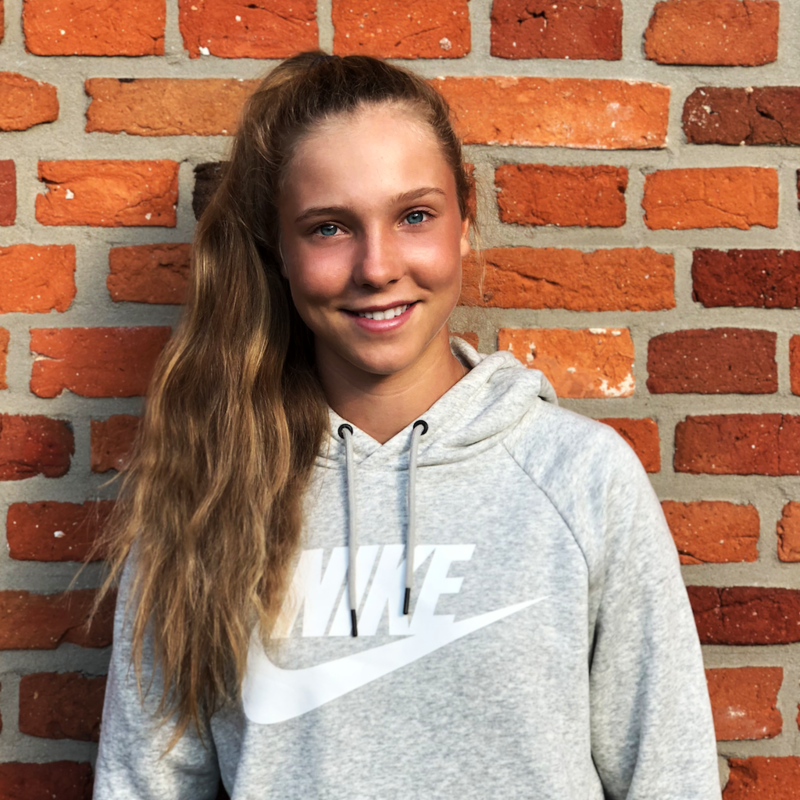 I would be 18, so my goal is to play WTA tournaments and qualify for Grand Slams! Roger Federer has been my idol since day one. I love how passionate and enthusiastic he is about the sport, and he keeps inspiring me every single day. I still remember my first tournament very well. I was really excited and got my first trophy right away. What a great feeling that was back then. I am a huge fan of freeletics and fitness without weights. I prefer a rather short but high intensive workout in order to perform my best. For me personally, this is currently a big challenge but I believe if you’re really passionate about something and try to keep pushing yourself to your limits every single day, that nothing can stop you from achieving your dreams. Competing with the best players in the world.